We’d love your help. Let us know what’s wrong with this preview of Black Market by Ben Davies. To ask other readers questions about Black Market, please sign up. Five stars doesn't really seem like enough for this book. It is so much more than a book about the animals of the black market. It is about a world where a rhino's horn can be worth more than five times its weight in gold. It is about thousand year old traditions that claim a glass of cobra's blood a day is good for the heart and bear bile will cure nearly anything. It is about how poor farmers, desperate to feed their families, resort to poaching for middlemen who pay the farmers little and the Five stars doesn't really seem like enough for this book. 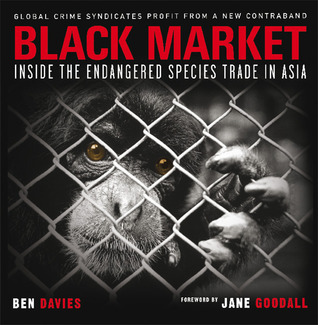 It is so much more than a book about the animals of the black market. It is about a world where a rhino's horn can be worth more than five times its weight in gold. It is about thousand year old traditions that claim a glass of cobra's blood a day is good for the heart and bear bile will cure nearly anything. It is about how poor farmers, desperate to feed their families, resort to poaching for middlemen who pay the farmers little and then sell the product at least three times the price on the market. And more than anything, it is about the greed of the wealthy who are willing to pay $18,000 for a shawl in the US or Europe, $30,000 for a Komodo dragon, and $100 for a bowl of Shark Fin soup in Asia. Even more powerful then the numbers are the stories of the people caught in the middle of the greed and ignorance. Patrick Brown's photographs are unforgettable. I only wish some of his own personal stories of the people he met while traveling were included as well, for my previous knowledge of those stories made his work even more powerful.